1-What is the meaning of life? 2-What is happiness all about? 3-Why did you start a blog? 4-What is more important in your life: relationships or fame? 5-What is the one thing you like about blogging? 6-What is the best decision you ever made? 7-Do you believe that unconditional love really exists in any kind of relationship? 8-Do you believe in Karma? If yes then what are the good and bad Karma according to you? 9-Do you believe in rebirth or afterlife? If yes, then why? Yes…I hate thinking that when life is over nothing else comes but darkness. 10-What is the best moment of your life? 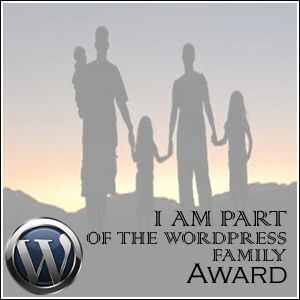 I am deeply honoured by the nomination of my blog. Thank you! One is enough . Thanks a lot.